I was surprised at how little whole wheat flour is in this, it really is light whole wheat. 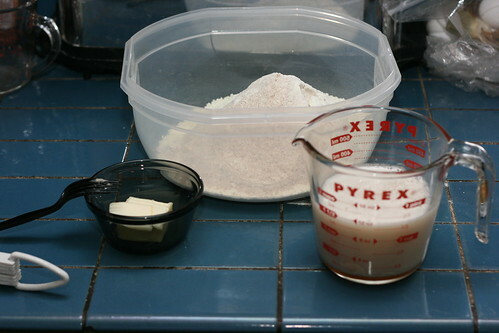 Anyway, I mixed the flours, powdered milk and salt together, and the water, honey, and yeast together. The butter, as opposed to the cheese, stands alone. Then it all got mixed up! 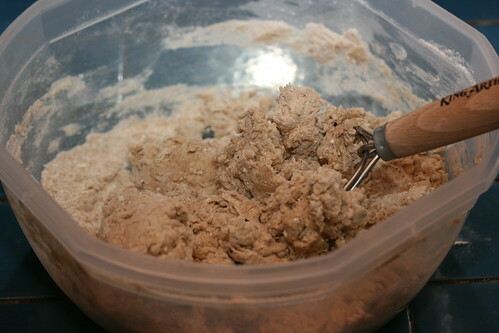 It mixed together pretty easily, so time to knead! 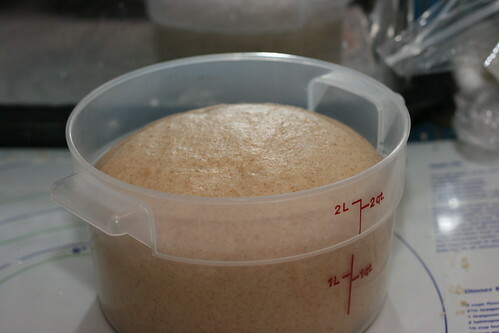 The dough started out fairly sticky but came together pretty quickly and felt nice to knead. Although, as with many breads, it made me really curse the title counter that makes me need to use a plastic sheet to knead on. 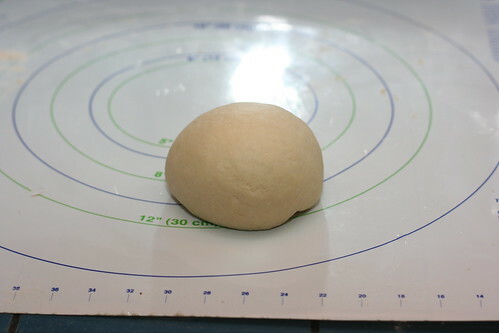 Trying to keep that sheet in place with doughs that are at all sticky… is tricky. I think I need to get a big chunk of butcherblock, or some other sort of wood I can plop down on the counter. 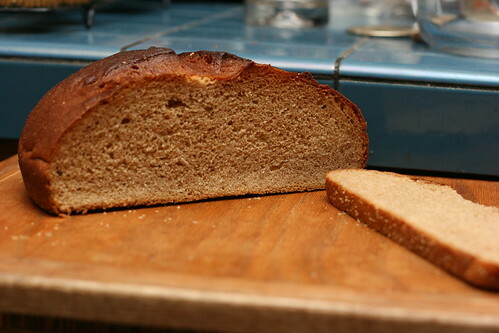 Then while I was waiting for that dough to rise I threw together the ingredients for the whole wheat bread for my dad. It used milk, an egg, applesauce(home made), and muscavado sugar. I used white whole wheat for about a third of the flour. 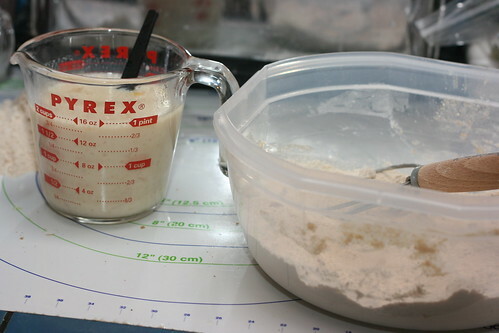 The recipe asked for you to reserve a cup of flour, mix the initial ingredients, and then knead that final cup into the dough. 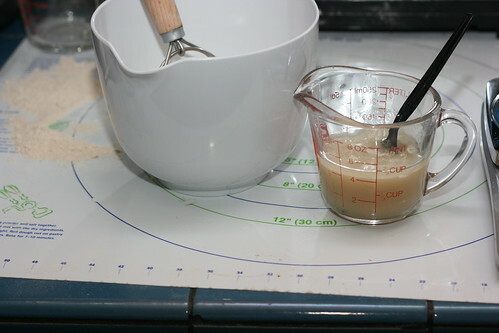 I don’t think I’ll go that way if I make it again as the dough was far too wet to kneas with the initial flour, and I ended up needing to add even more than they asked for to get it at all manageable. 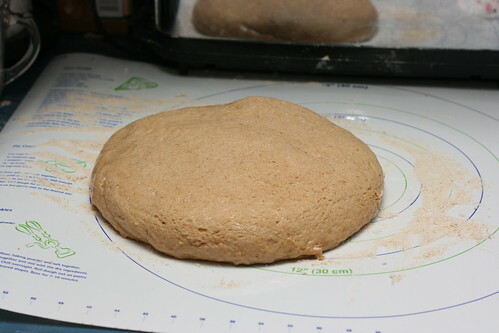 While I left that and the other dough to the side to rise, I started the dough for the Lavash. This is a pretty simple recipe and it was relatively easy to quickly mix the dough up; just flour, water, salt, yeast, oil, and honey. I followed that up with a few minutes kneading, and it too was ready to go. And now back to the Light Wheat! 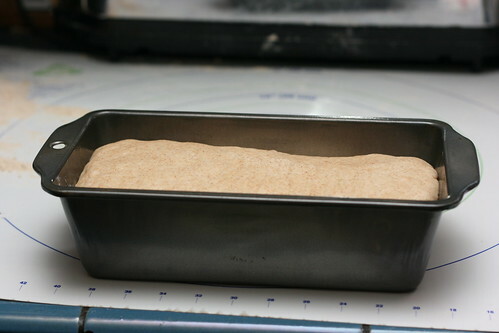 It had risen quite well, so it was time to knock it back a bit, shape it into a loaf, and set it aside for another rise. It was definitely the stiffest dough I’ve dealt with in a while, it held its shape quite well when I dumped it out of the dough bucket! Which isn’t to say it was too stiff, it was pretty easy to work with, I’m just used to dealing with high hydration doughs lately. 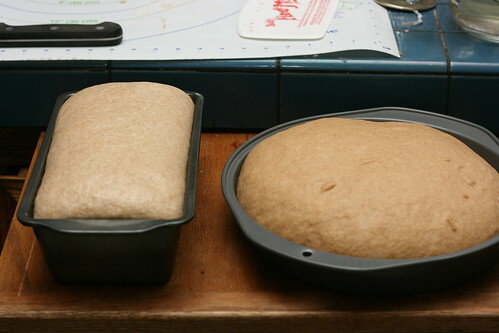 It was really easy to knock down and get the dough shaped as a pan loaf, although I did have to futz with it a bit as I kept making it too long for the pan. 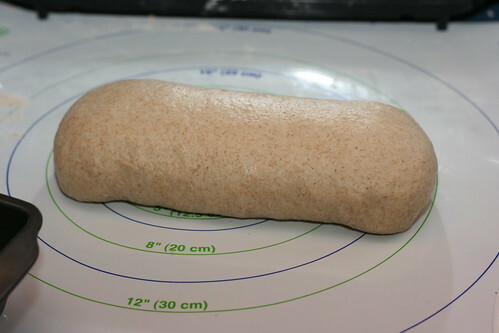 And now back to the whole wheat loaf, it was still a pretty sticky soft dough, more like what I’m used to now! 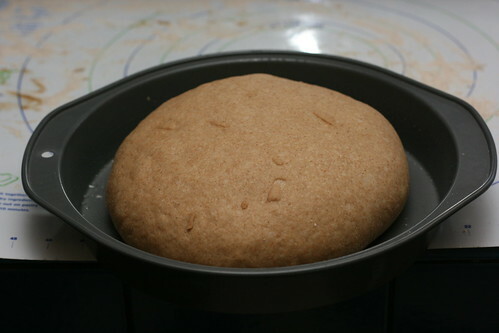 According to the recipe the bread was going to be baked in a pan, but a 9″ cake round, not a loaf tin. 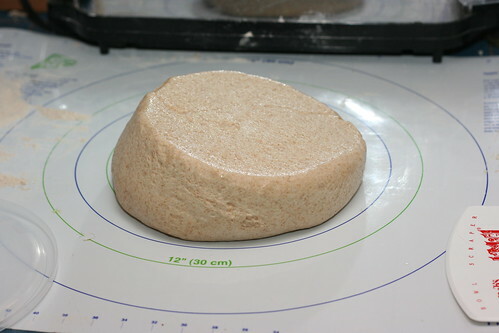 So I turned the dough out, degassed it some and rather stickily shaped it into a round. It was just stiff enough to not spread out too much, but I was glad the sides of the cake pan were there to contain it. The recipe calls for scoring the dough here before the final rise, but I decided to do it before the bread went in the oven instead. 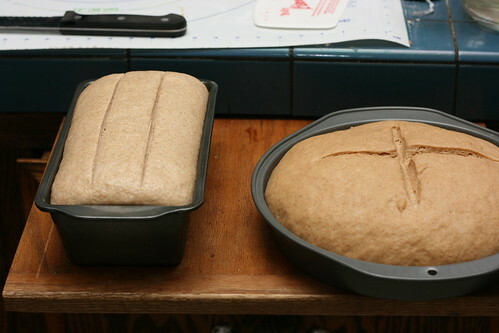 Both of the two wheat loaves took about the same amount of time to rise, perfect timing since they both baked at 350 degrees and could go in the oven at the same time! Just before the loaves went in the oven I scored both of them, two straight slashes on the Light Whole Wheat and an X on the Whole Wheat loaf (although that one I scored a bit too deeply). 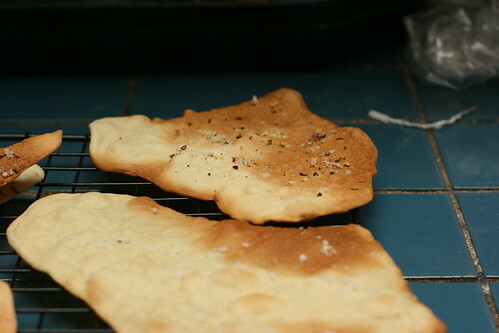 I didn’t get any photos of the intermediate steps, but I used my pasta machine to help with the lavash. 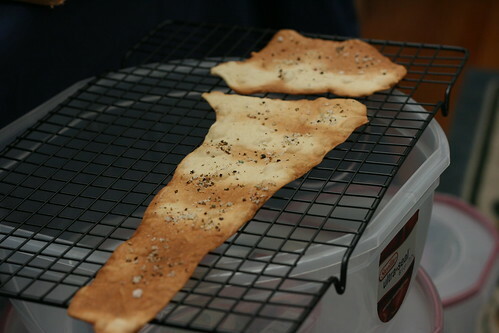 I’ve made lavash previously, and while I could get it very thin, in getting it to the parchment paper and baking sheet it always contracted too much. And rolling it on the baking sheet was just not happening. I really wanted to avoid that this time because the thick lavash just don’t cook quite right in the oven, so I enlisted my pasta machine (hand cranked kind). 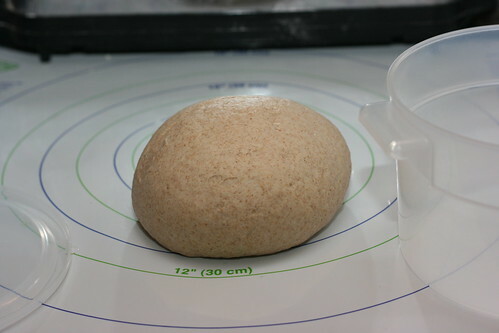 First I rolled some of the dough out roughly with a rolling pin, then I fed it through the pasta maker a few times on increasingly thin settings. I had to practice a little this way, as the lavash dough is much more hydrated than pasta dough so it caught and tore a bit more. I found though that even just passing the dough through the pasta machine, made it easier to use a rolling pin to get it the right thickness, and the smaller pieces I made this way were easier to get to a baking sheet without thickening up. 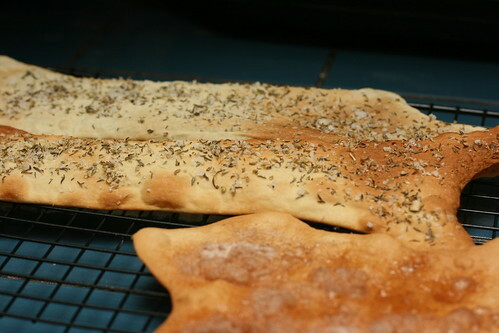 I made four different kinds of lavash, cinnamon sugar, sea salt and black pepper, sea salt, and sea salt and herb. Assorted pictures of those follow! The lavash looks really tasty, I like the selection. The wheat breads look nice too, bet they work well for sandwiches. Nice job. Everything looks so tasty, especially the lavash. 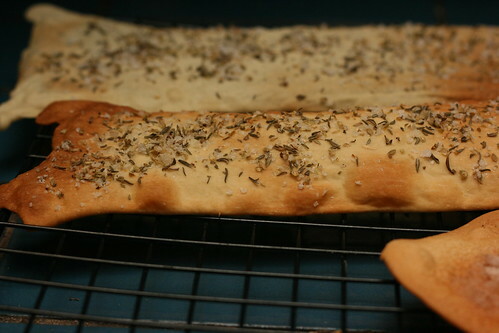 The lavash was really tasty, came out a lot better this time than the previous times I’ve tried to make it. And the cinnamon sugar version is really a must! Thanks for the kind words! Baking is wonderful, isn’t it? Just something so satisfying about it! 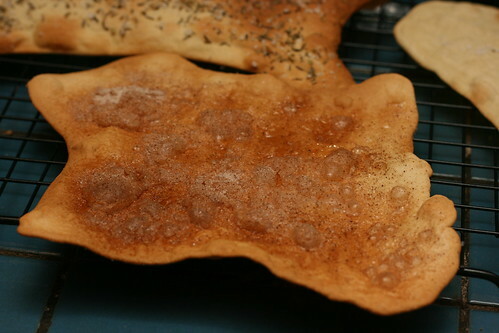 I highly recommend the cinnamon sugar lavash, you need to put more on than you would think you do, and you get that lovely bubbled glaze. May the yeast be good to you!